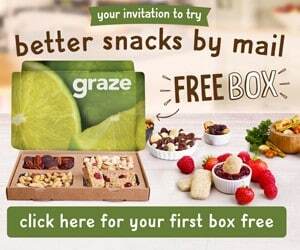 You can sign up for a tasty FREE snack box from Graze! You pick the snacks that sound best to you, and they arrive in your mailbox in perfectly portioned snack packs. If you like your FREE Graze box, allow the subscription to continue. You can get your snack boxes from Graze.com on a weekly or biweekly basis.